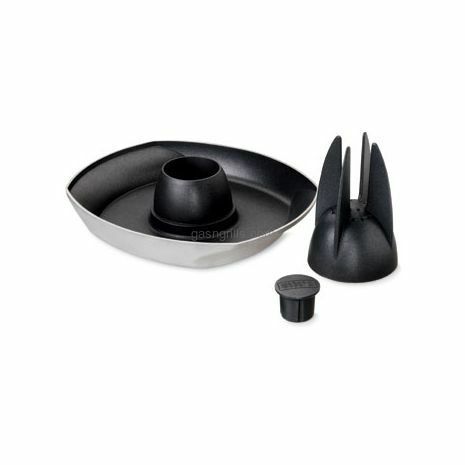 Weber Poultry Roaster.Poultry roaster includes a non-stick roasting pan, infuser, and infusion cap. First, fill the base cup with your favorite beverage and add spices for extra zip (do not use with alcoholic spirits, though they are volatile and will catch fire!). Next, place the infuser over the base cup and perch the bird on the infuser. 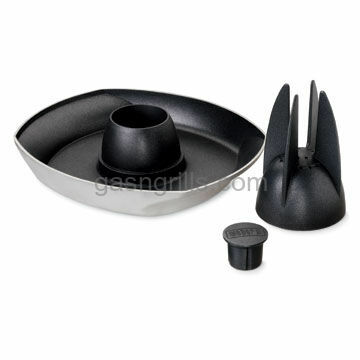 Place the infusion cap in the neck cavity and set the poultry roaster on the cooking grate. Aromatic steam rises to roast the bird to perfection. 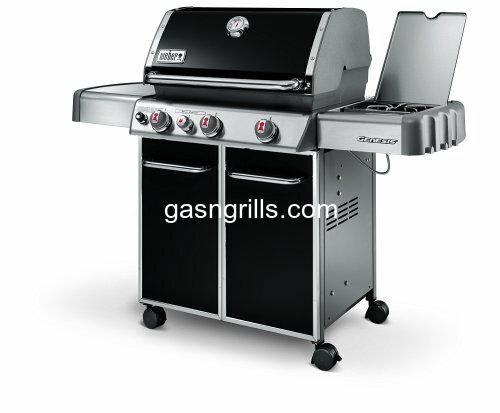 Use on 22-1/2 inch or larger Weber® charcoal grills and all Weber® gas grills (will not fit Weber® Baby Q, Weber® Q 100, Weber® Q 120 gas grills). Watch the interactive video and see why you need to add this accessory to your grilling repertoire!